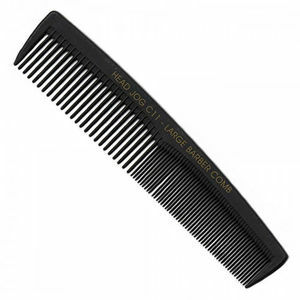 Strong, lightweight and durable carbon fibre barber comb. The Head Jog C11 Large Barber Comb is made with a high carbon content, so it's durable, strong and heat resistant up to 230°C (making it perfect for use with a hairdryer or straightener). It's designed specifically for barbers, with both wide- and narrow-spaced sets of strong teeth and a flexible body. It's also static free, to help prevent frizzy, fly-away hair during styling.